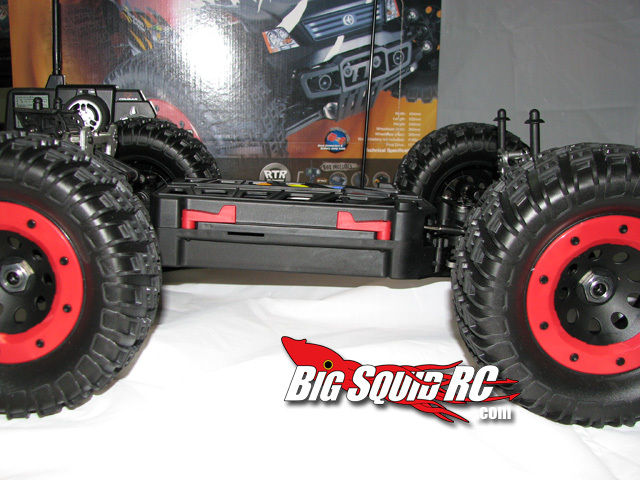 Thunder Tiger MT4-G3 1:8 Electric Monster Truck Review « Big Squid RC – RC Car and Truck News, Reviews, Videos, and More! Where to Buy: Tower Hobbies, or ask your local shop to order one for you. From the moment we received the new Thunder Tiger MT4-G3 in the office, it has caused a couple of arguments. On the box, it clearly states that it’s a 1:8 scale Monster Truck. According to many, anything with a center diff needs to fall under the truggy category. 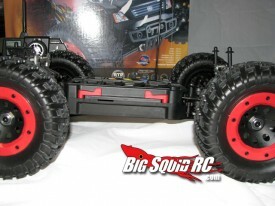 Either way, truggy or monster truck, Is this truck going to be a must own for bashers? Continue reading …. While the box design left a little to be desired, out of the box this truck is a beast. It’s big, it’s heavy, it has enormous tires, and it looks like it wants to eat any short course vehicle it can catch for lunch. Yum! What’s in the box: Everything but batteries come in the box. You’ll need to install the wheels, and the wheelie bar. The vehicle is a wheelie machine, so take the time before going out and just put the thing on. Trust us. This is the first time I had the chance to use the ACE RC Cougar PS3i radio system, and it works well. I had to hit the manual for a few a adjustments I couldn’t figure out, but once I knew how it worked, it did it’s job. The receiver is tiny. It would be great if all receivers were this size. My only issue with it, the 1 foot long antenna. Why do I have a foot long antenna on my 2.4ghz receiver? I thought these things evolved and lost most of their tails by now. 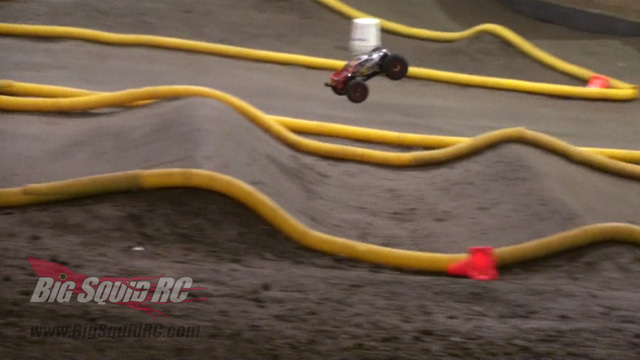 Test Locations: Leisure Hours Raceway indoor dirt track, secret dirt oval location, parking lots, back yards and streets. Looks: With the body on, the truck looks like your standard big monster truck. Put it down next to any other truck though and you will see some differences. The tires are huge compared to anything else right now, probably a inch bigger than standard Savage or Revo tires. 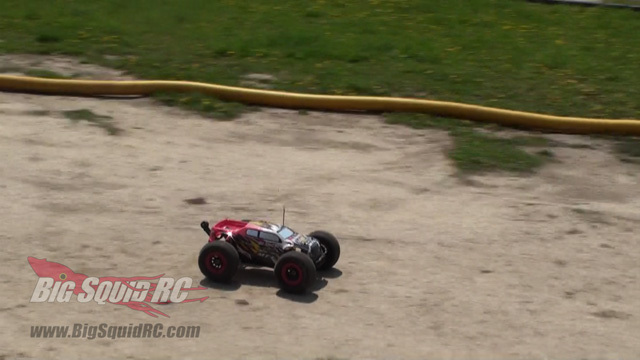 With the body off, you can see this isn’t your standard RC truck. Everything is enclosed inside of this chassis/rollcage sandwich. If you want to turn some heads, just leave the body off for a while. EVERYONE will stop and ask about it. Jumping: Flying through the air with this truck is a blast! After we got the brakes working and feeling like we wanted, the air was ours to master. Before the brake reduction, just a tap of the brake would put the truck on it’s lid or you rode it out for a forward flip. 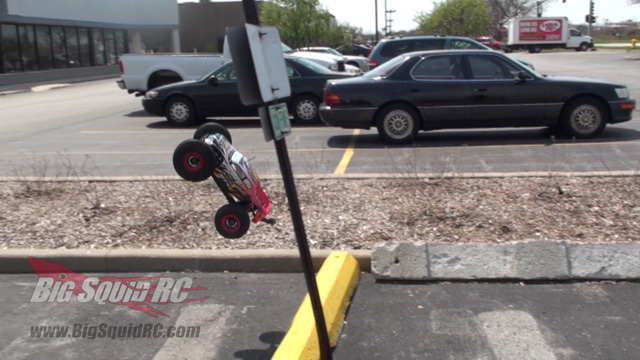 After we were dialed though, the truck flew far and high! In one video you can see we are well above the basketball hoop and into the trees. 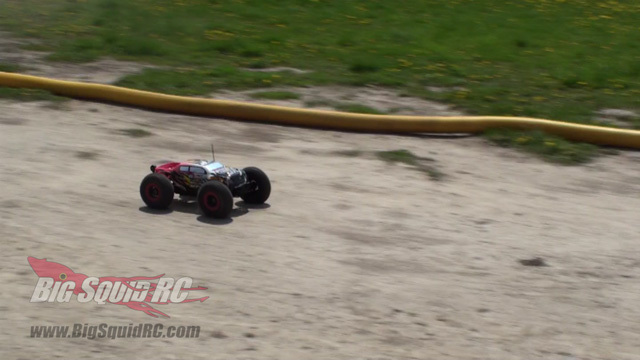 The MT4-G3 found the ground with all four tires like a cat. It was easy to adjust in the air and land it however you wanted. At the track we had no problems clearing the triple. Stopping the 9 pound truck before the turn after the triple was another story, but clearing it, no probs. 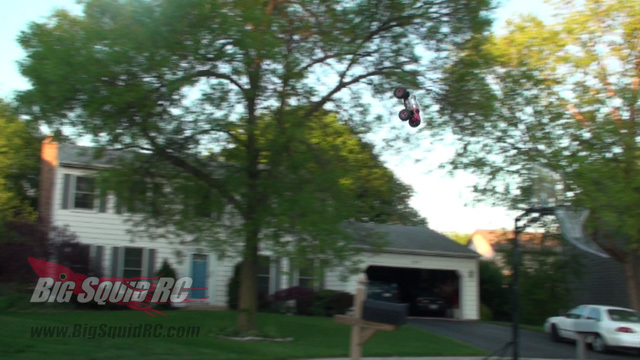 There is big air, and then there is MONSTER air, and this truck loves the monster stuff. Durability: This truck is built like a tank! With the abuse we have been putting it through, we should of easily destroyed a couple of gears, the front end of the truck, and several shocks. To our disbelief, we have not broken, busted, or stripped anything! Because we like to get crazy, this truck has taken dozens and dozens of hard hits from 20+ feet high and landing on pavement. All of our curb jumps, back flips, landing on full throttle trying to come out of a flip should of destroyed some gears, but it hasn’t. Out of the box, this has been one of the toughest (if not THE toughest) trucks we have ever tested. Mechanics: The truck isn’t too bad to work on. We have taken it apart to just check it out and see how things worked, and for the most part it’s easy. The manual does a good job of showing the break down and exploded views. Our biggest grief with it is the lack of waterproof electronics. A lot of companies have been playing catch up in this area, and with a truck this new, we would of liked to see the ability to bash in the snow or rain out of the box. Best Mods: The truck is pretty dialed, and since we haven’t broken anything, there’s not much to suggest for hop-up needs. I think some thicker center diff fluid would help keep the front wheels from ballooning as often and give you a little more bite on different surfaces. Pre-loading the shocks a little will help also. I’m pretty sure the foams inside the tires are dust by now or at least torn from the abuse. That may be the first thing we need to replace. Overall: This is seriously one heck of a truck! It’s a blast to drive and catch big air with. It’s built like a tank, and has survived everything we have thrown at it. It looks different from the other monster trucks out there while being fast enough right out of the box. The price point, just over $500 is about right and inline with other trucks of this size. There are not a lot of hop-ups for it, so hopefully it will see some support from 3rd party companies. 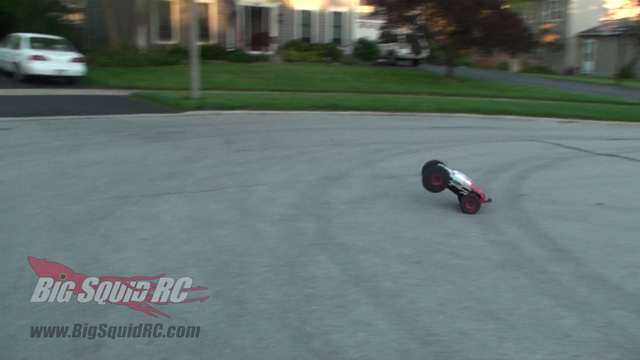 The chassis sandwich is great for protection, but loves to hold onto rocks and dirt inside. Around the office we are still fighting over the truck or truggy aspect. It says monster truck on the box, but there are a lot of people that claim as soon as you have a center diff, it’s a truggy. Either way, if you are looking for a big truck to have a blast with while bashing with your friends, this should be one of your top considerations! 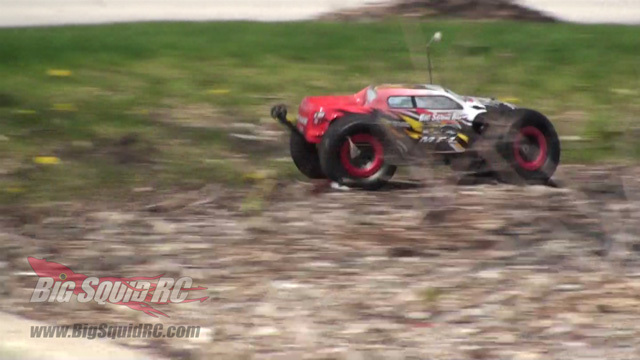 Time To Bash – 8.5/10 – Install the wheels, charge some batteries and head out. Workability – 8.0/10 – The truck layout isn’t too bad to work on. Getting to the center diff is a little rough. Car Show Rating – 8.5/10 – Not a ton of bling, but with the body off, this chassis will get some serious attention! Bash-A-Bility – 9.5/10 – Waterproofing would of made a perfect score. 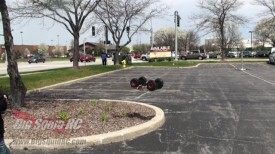 This truck took everything we could throw at it, and threw it back! Big Squid Rating – 9.0/10 – Tentacles.. Amazing Power, incredible durability. It’s almost the perfect basher vehicle. Want more pictures? 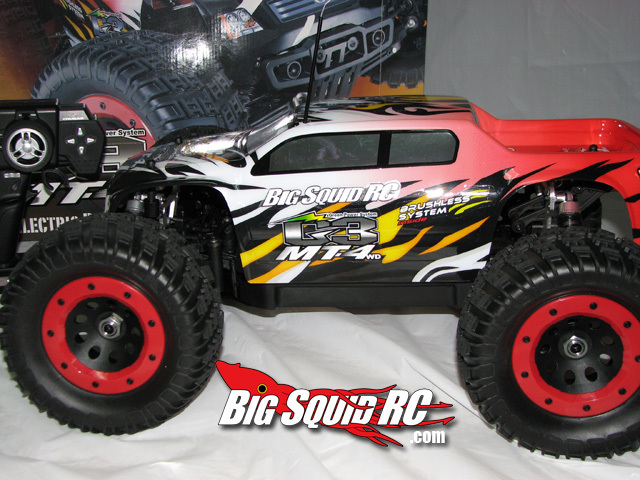 Check out our Thunder Tiger MT4-3G unboxing photos.